Having only one child can be a problem sometimes. Like when I need emergency kid models and one won't cut it. Thankfully, my friend Julie loaned me her two for this Halloween assignment. I wouldn't have been able to finish without them. It’s so hard to be little and behave well for hours in the hot sun, but they did great. 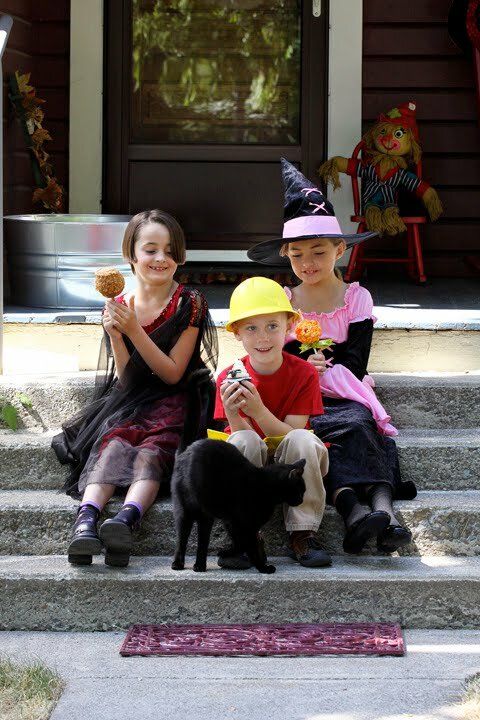 Sadly, the kids didn’t make it into Yum Food and Fun for Kids this time, but I still have cute shots of them to enjoy. This kid-friendly recipe starts with a bag of caramels. Feel free to use any kind of Halloween candy you have around for pressing into the sides. I think Snickers bars, M&Ms or chopped chocolate covered pretzels would be especially tasty here. This is a fun way to use up some of that excess candy and enjoy the fall apple harvest. 1. Wash and dry apples. Twist off the stem and place a wooden dowel or popsicle stick into the apples. Lay out a piece of wax paper to set apples on. 2. Place candy bars in a gallon-sized bag and crush into small crumbs with the back of a spoon. Place crumbs on a large plate. Set aside. 3. Place caramels, half & half, corn syrup and salt together in a shallow bowl. Microwave in 30 second increments on high stirring at each stop. Repeat until well melted. Stir in vanilla extract. 4. Roll an apple in caramel spooning some over the top. Let the excess drip off and spoon off the bottom. Dip the bottom in the crushed candy. 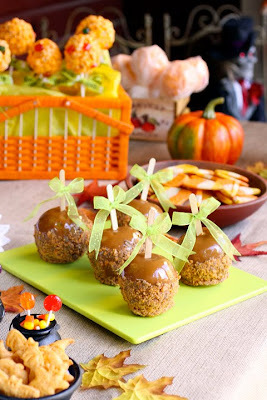 Scoop up some of the candy and pat crumbs onto the sides of apples. Place apple on wax paper. 5. Reheat caramel between each apple for 15 to 20 seconds. Stir and repeat with the rest of the apples. If desired, trim bases of apples with kitchen shears. Yields 5 Apples. Prep time 20 minutes. Setting time 1 hour. From Yum Food and Fun for Kids Magazine, October 2010 by Laura Flowers. Ugh, I’m digging into the Halloween candy again! Just sitting here devouring Nerds, hoping the sugar hits my brain enough to push me into creative mode so I can finish putting together a photography session. Now I need something salty like this dip. Too bad I photographed it back in August. If I’d kept it around it would’ve truly been Halloween worthy. Perfectly set right next to the porch skeleton and his bride. I’m only kidding! I’m not that nuts. 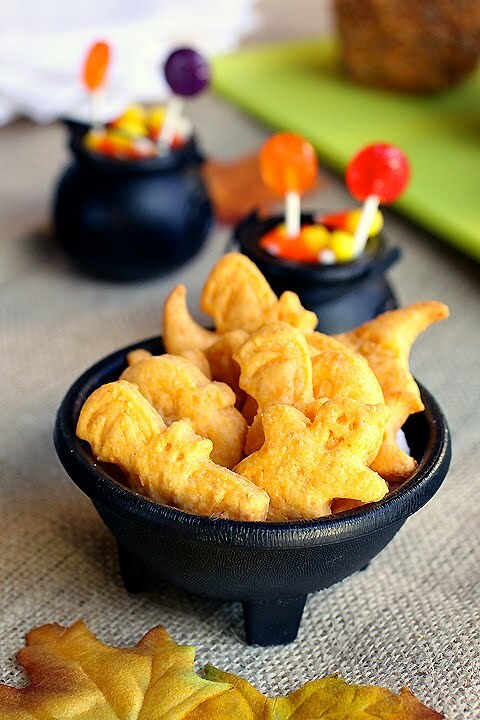 Isn’t it nice though to have some salty savory type treats to balance out all the sugary candy goodness around Halloween? 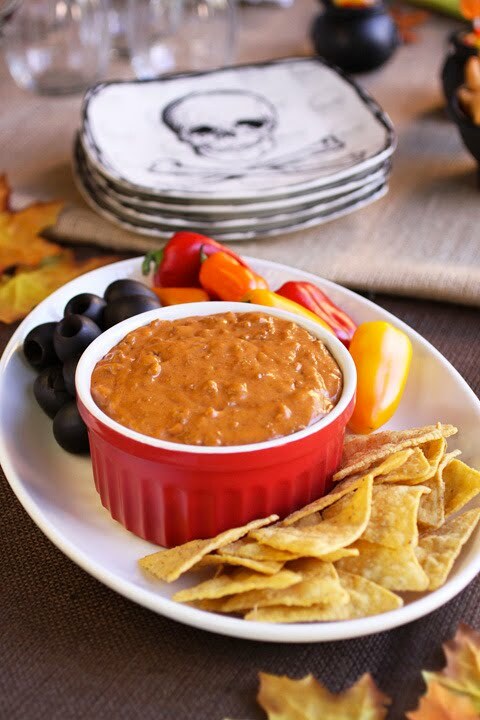 This dip is both fast to throw together and pleasing to big and small goblins and ghouls. On another note, If you’re attending the Foodbuzz Festival the following week, Marc from No Recipes and I will be leading two sessions. I hope you’ll sign up for one of them. Marc will be tackling lighting, SLRs and point and shoots. I’ll be talking about composition, shape, texture, tension and photography rules to draw the eye to your shots. Marc and I will then break off into two groups and take our food blogging friends aside to teach them some hopefully new techniques. It should be fun for all of us. I can’t wait to see some of you there! 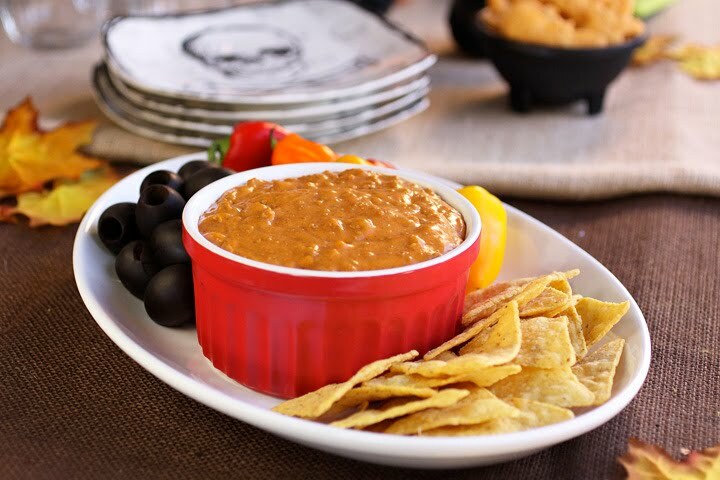 Kids and adults alike will dive into this cheesy meaty dip. 1. In a bowl toss together the cheese and flour. Set aside. 2. In a 3 quart saucepan heat the milk, chili powder, paprika, onion powder, and salt over medium high stirring frequently until bubbles start to form around the sides of the pan. Add the cheese and stir until melted. Add the chili and stir until warmed through. 3. Serve warm with tortilla chips, sweet mini peppers and colossal sized black olives. Yield 8 servings. Prep time 10 minutes. Recipe from Yum Food and Fun for Kids October 2010 by Laura Flowers. I shot this recipe so long ago I’d nearly forgotten about it. 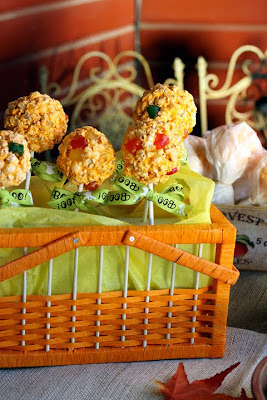 Now that I’ve remembered, I think I’ll take these orange tinted popcorn balls as goodies to my daughter’s school Halloween party. The stick itself is more of a gimmick on these fall threats. 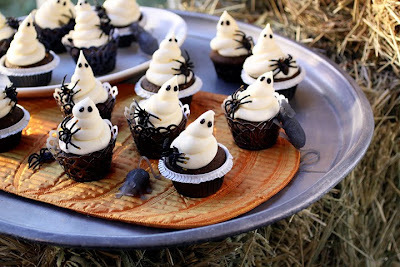 Cute, but not necessary, and I’ll be leaving them off when I make these for the kids. Feel free to skip that part as well; because stick or no stick, these candy packed treats will be welcomed by popcorn ball lovers everywhere. Bright and fun this is a great recipe to get kids excited to help out in the kitchen. 1. With an air popper, pop popcorn kernels in two batches into a large bowl. Pick out and discard unpopped kernels. Add the Dot candies and set aside. Lay out a long sheet of wax paper. 2. Add the mini marshmallows, butter cubes, water and salt to a large microwave safe bowl. Microwave on high in 30 second increments until melted stirring after each turn. Then stir in a small amount of orange color paste. 3. Pour the marshmallow mixture over the popcorn. Toss well to coat. Wet hands and scoop out mixture with two hands. Press the batter together well. Set on the wax paper. Repeat with the rest of the popcorn mixture wetting hands as needed. 4. Insert the sticks all the way through the popcorn balls. Press the popcorn around the sticks well. Place back on the wax paper to dry. Repeat with the rest of the popcorn balls. 5. Let sit for two hours to dry. Once the popcorn balls are solid wrap in sheets of wax paper and secure with rubber bands or ribbons. Yield 11 popcorn balls. Prep time 20 minutes. Total time 2 hours 20 minutes. 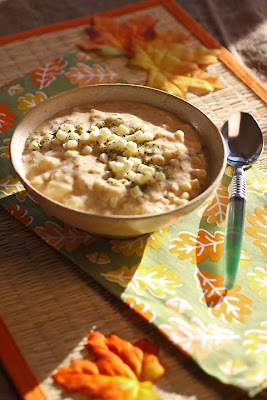 Recipe and photograph for Yum Food and Fun for Kids magazine, October 2010 by Laura Flowers. This is good pie. Strike that. This is seriously great pie that I could eat everyday for the next year. This is also pie for the sake of my waistline I should never make again. Therefore, I am passing off my pain to you. I’m happy we picked only one bag of apples Friday, or I’d be buying bigger pants. Gingersnaps help soak up the maple syrup and add flavor of their own to this fall apple pie. 1. Place the oven rack on the lower third of the oven and preheat to 400 degrees. Line a 9 1/2 “ deep dish pie pan with a bottom pastry. 2. Mix the apples with the maple syrup and gingersnaps in a large bowl. In a small bowl mix the brown sugar, flour, cinnamon and salt. (Don’t skip this step or your pie will have starch clumps.) 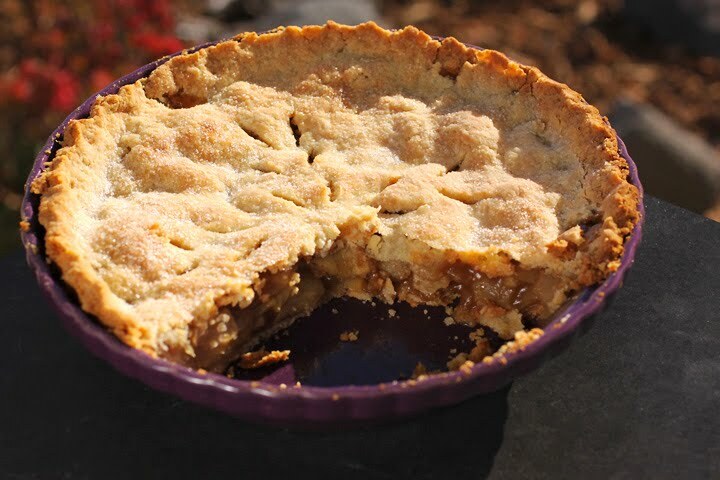 Toss the sugar mixture in with the apples and arrange the mixture nicely in the pie shell. 3. Dot the pie with butter, top with the second pastry and flute the edges. Sprinkle with sugar. 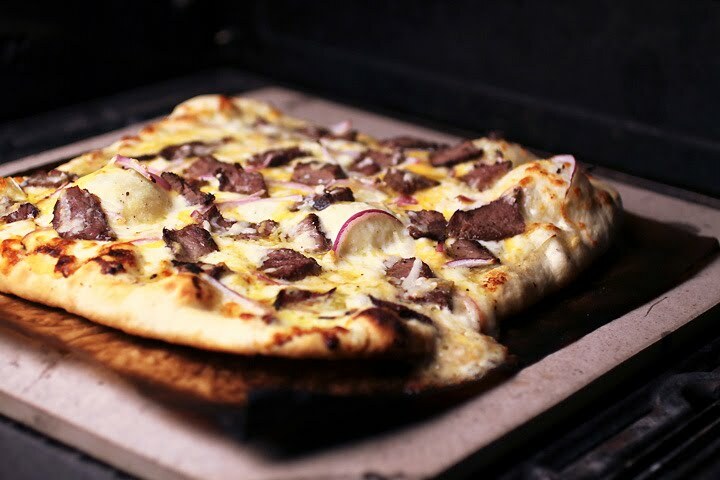 Cut holes in the crust to vent. 4. Bake for 30 minutes. Place on a pie crust shield and lower the temperature to 375 degrees. Bake for 25 to 30 more minutes until the crust is golden and the filling is bubbly. Cool for several hours before serving. Jesse asked me to make baked spaghetti for our Friday evening get together with friends. Ok, that’s only partially true. 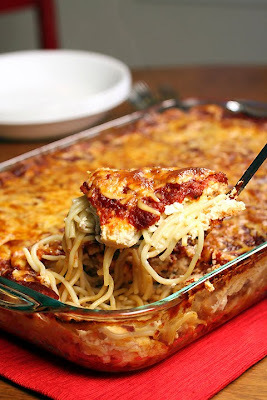 Jesse has been asking me on a semi-regular basis to make baked spaghetti since we got married. I’ve been beating around the bush trying to escape this task for years. The only baked spaghetti I ever knew were dried out noodles with sickeningly sweet Ragu that always arrived with the traditional potluck fair. I called Julie and warned her Jesse had requested baked spaghetti. She tried to be kind, but I don’t think her experiences have been much better. I couldn’t imagine serving my poor friends a meal they dreaded. They deserved something they could at least choke down. So, I sucked it up and gave this recipe some thought and attention. The results were much better than I expected, and most certainly not as bad as my worst fears. Or perhaps, everyone was just being polite and ate it anyway! Hey, it could happen. This marinara cooks for about 10 hours, so it’s often easier to make this the day before you’ll be using it for baked spaghetti. You’ll need a big 10” x 15” baking dish for this recipe, if you don’t have one you can break it up into two smaller pans. For a vegetarian version, leave out the sausage and toss the spaghetti with the extra marinara sauce before layering it into the bottom. 1. Brown the sausage in a skillet breaking it up well. Drain off the fat and set aside. Preheat the oven to 400 degrees and get out a 10”x 15” baking dish. 2. Boil the spaghetti to al dente according to package directions in heavily salted water. Toward the end of cooking time reserve 1/2 cup of pasta water. Drain the spaghetti and toss with butter and olive oil. At this point you can also toss the spaghetti with the leftover sauce if preferred. Place the noodles in the baking dish. 3. In a bowl, mix the ricotta with the reserved pasta water. Place the sausage on top of the noodles and spread the ricotta over everything. 4. Top ricotta with 1 cup Parmesan Reggiano. 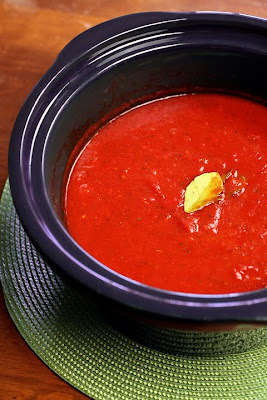 Spread 4 cups of sauce over the cheese and top with mozzarella and the remaining Parmesan. 5. 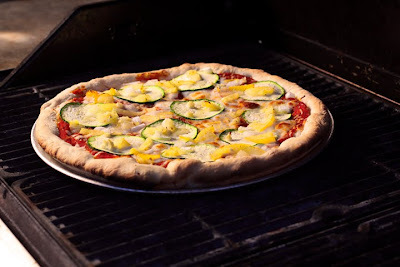 Bake 35 to 40 minutes until the cheese is golden brown and the sides are bubbly. Rest for 10 minutes before serving. Serve with the extra sauce if desired. 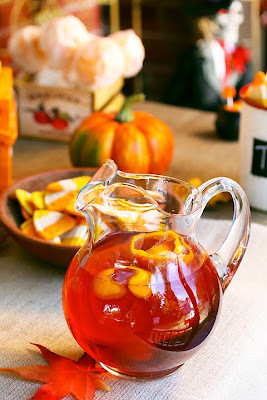 This recipe is really more juice-like than punch-like, but it’s light, refreshing and something the kids will enjoy maybe more than the adults. It would go well at a fall party for children. Or perhaps welcomed by the kid at heart. When I think of this punch, I recall the kids I took photographs of all dressed up for Halloween in August. I can’t help but laugh and remember the looks on the faces of passersby who must have thought we were totally and completely insane. 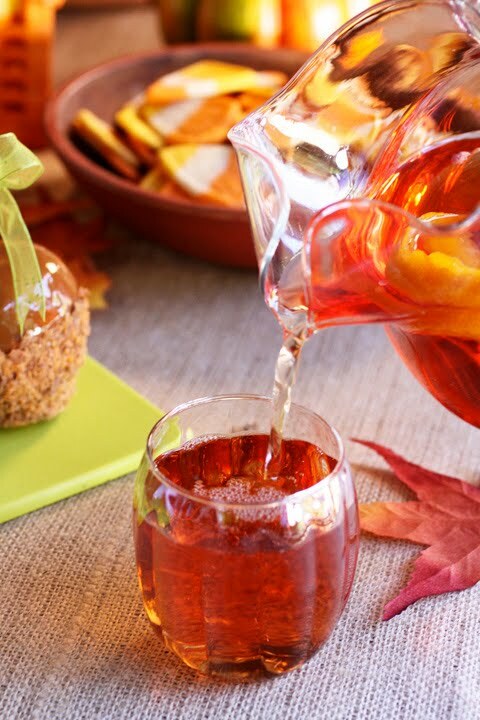 Simple and sweet, serve this punch warm or chill and enjoy cold. Warm the ingredients in a large saucepan over medium low heat. 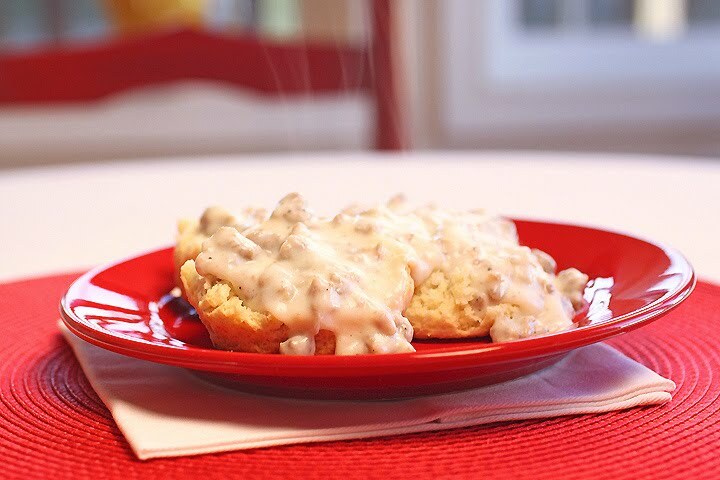 Serve immediately for warm drinks, or cool and then refrigerate for cold punch. From "Yum Food and Fun for Kids" Magazine, October 2010, by Laura Flowers. Is it really October already? 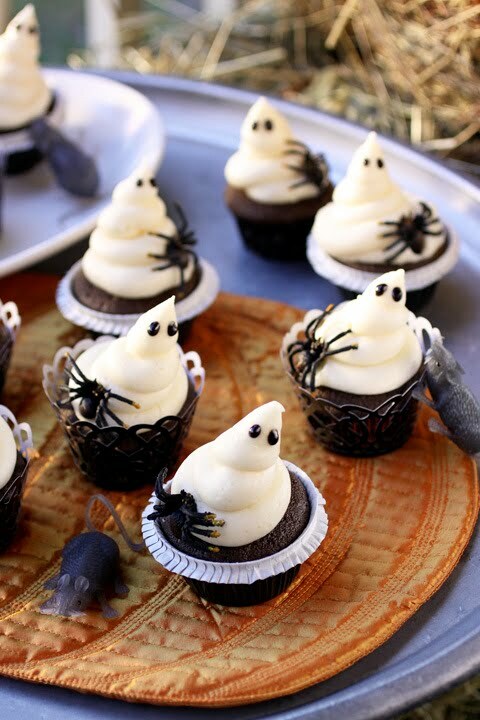 Then I suppose it’s time for some Halloween treats. I wrote and shot this recipe for the October issue of Yum Food & Fun for Kids. Now that the magazine is out I can share these crackers with you. I gave Kathia from Pink Little Cake first dibs on these cheesy snacks, so you may have already noticed them floating around. She was kind enough to have me as part of her fun filled month of Halloween guest bloggers. If not though, here’s the recipe. Oh, I almost forgot! I wanted to share that I get to attend Foodbuzz's Festival thanks to Nature's Pride Bread. Thanks for crossing your fingers for me, it must have worked! I can't wait to see all my food blogging friends! Nature's Pride thank-you thank-you thank-you! Making crackers at home is like magic and these are the most magic of all as you watch them puff up into cute little Halloween shapes. Cut this recipe into any shape you prefer to enjoy homemade crackers year round. 1. Line cookie sheets with parchment paper. Set aside. 2. In a food processor pulse together the flour, salt, paprika and onion powder. Add the butter and process until combined. Add the cheddar and pulse until finely chopped. Process in the egg yolk and water until the mixture forms a ball. 3. Remove the dough and knead in your hands for a few turns. Divide in half and roll one part between two pieces of wax paper to 3/8 inch thick. 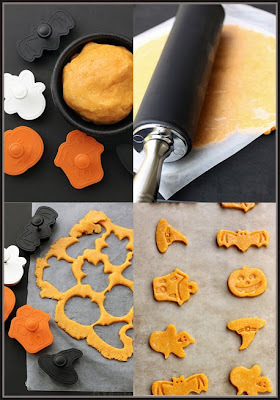 Peel off the wax paper and stamp dough with cookie stamps or cut with cookie cutters. Place the crackers on cookie sheets. 4. Freeze the crackers on the cookie sheets for 15 minutes. Meanwhile, preheat the oven to 325 degrees. Move the cookie sheets to the oven and bake for 20 minutes. Cool crackers on cooling racks. Store in an airtight container. Yields 54 3/8 ounce cookies. Prep time 30 minutes. Baking time 20 minutes. Recipe & photographs for Yum Kids October 2010 by Laura Flowers. After a very long hot day of white water rafting in Riggins, Idaho this summer we stopped by the Fiddle Creek Fruit Stand. This part fruit stand, part grocery store is packed full of nostalgia. A family run place, it looks like it's been passed down forever. Out of school for the summer, three small girls helped their grandfather at the cash register while he tended to customers, answered questions and introduced us to local items, proudly offering tastes of recently arrived crops. It made me a bit teary eyed to think that this piece of our past is nearly extinct. With super markets and big food, everything feels a bit on the impersonal side. I couldn’t help but wonder, “What kind of progress have we really made?” as I walked past several hues of lilacs and thornless raspberry plants for sale. I purchased some plums, but wanting something to remember the place by I grabbed a couple jars of Fiddle Creek’s homemade Blackcap Jam. Blackcaps, if you haven’t had them yet, are luscious little black raspberries. 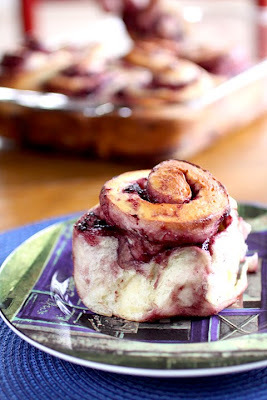 Since then, I’d been miserly enjoying it and finally decided to splurge and make these old-fashioned breakfast rolls. I felt it fit the store. Homemade and special. Well, with a little help from my bread machine they were homemade! 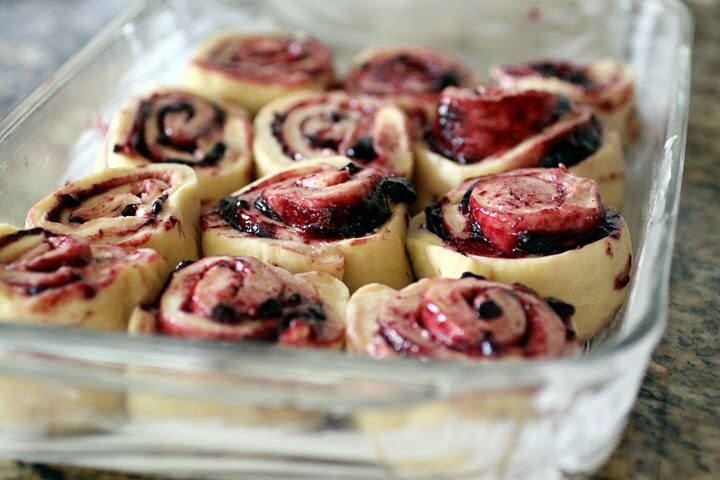 I used Blackcap jam, but any good quality jam or marmalade will work in these rolls. 1. Warm the milk in the microwave for 30 to 45 seconds until very warm to the touch. Place the milk, melted butter and sugar in the bread machine and stir to combine. Let sit for 15 to 20 minutes or until liquid reaches room temperature. 2. Stir in the eggs and salt. Add the flour and place the yeast on top of the flour. Select the dough cycle and press start. 3. Butter a 9x13 inch pan; set aside. 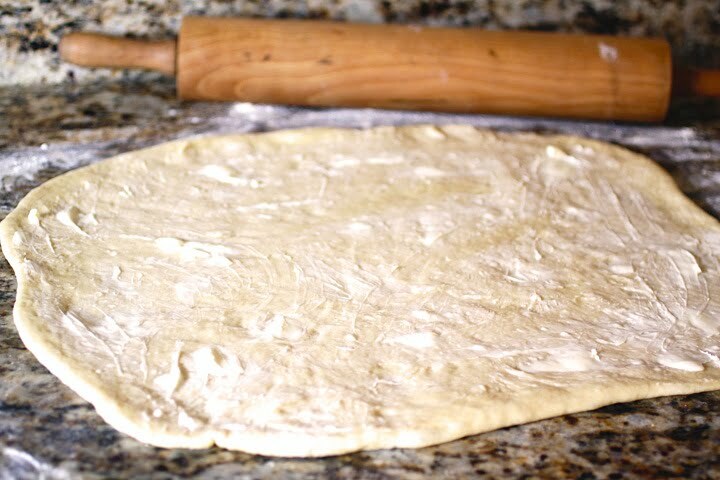 Roll dough into a 16x21 inch rectangle. 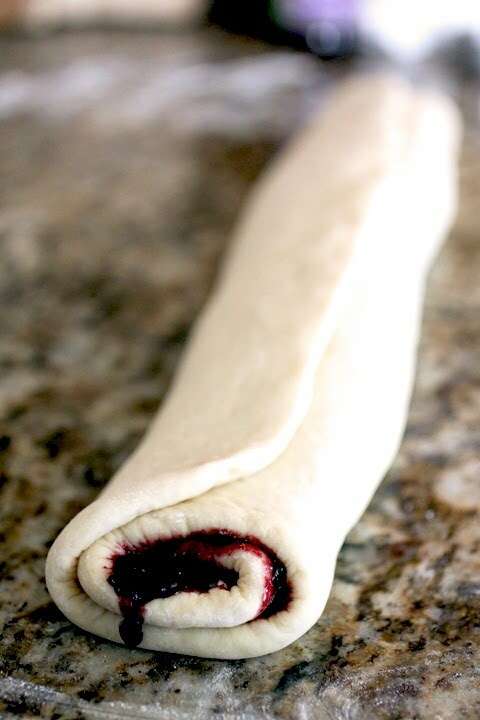 Spread dough with 1/4 cup butter then spread jam over the butter. 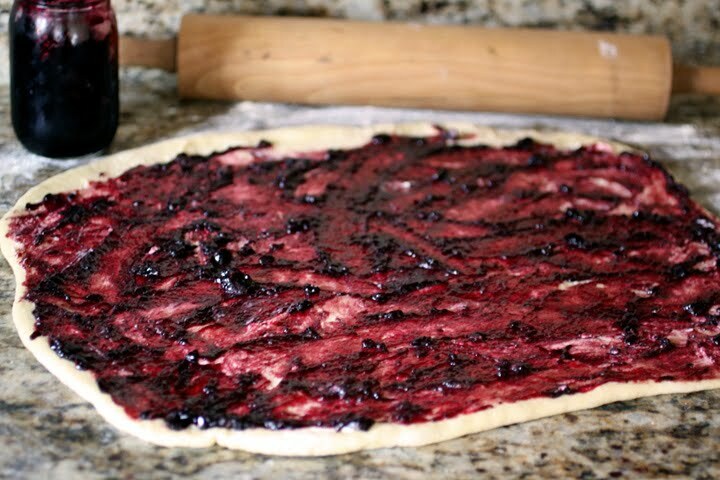 Roll up dough to make a long log and slice it in half, then slice each piece in half again. Cut each of those quarters into 3 slices. 4. Place rolls in the pan seam side toward the other rolls. Gently brush rolls with melted butter on the tops and sides. Sprinkle with sugar if desired. Cover with plastic wrap or a tea towel and let rise in a warm place for 30 minutes. 5. Meanwhile, preheat the oven to 400 degrees. Bake rolls for 16 to 18 minutes until golden brown.